Discover Watford's rich heritage with special free events and openings across the town! Explore inside the Free School, see the modernist gem that is Sugden House, find out about the impact of WW1 with West Watford local history group and have a cup of tea inside the Peace Hospice! 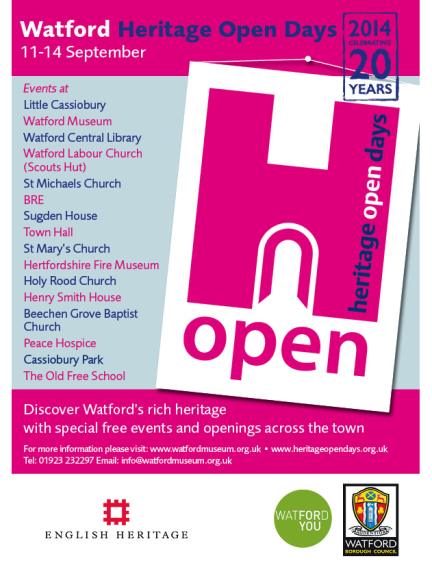 There is something for everyone in this weekend celebration of Watford's heritage. And the bonus? It is all free and happening between the 11 - 14 September in Watford! The full list of events across the weekend can be found in the guide to download below. Why not check out this Museums business in Watford. Watford Museum is a 'thebestof' business member.